Two locations. Double the convenience. With state-of-the-art MRI’s and diagnostic software at both of our hospitals, veterinarians now have easier access to leading MRI, Ultrasound and X-ray capabilities. 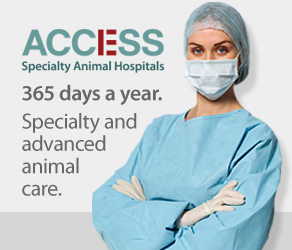 Add our highly qualified teams, their commitment to outstanding client service, and personal updates to referring vets, and you’ll understand why ACCESS Specialty Animal Hospitals provides some of the best MRI Services in Southern California. For further information, please do not hesitate to contact Dr. Jeremy O’Neill, Dr. Robert Powers-Davis, Dr. Clarisa Robles, or Dr. Malte Schwartz.